Toyops professionals are available by phone Monday – Friday from 8am - 5pm (Central Standard Time). If you call after hours, leave a voice mail message to receive a call back the next business day (remember to leave your name and number). If you are a Triops retailer or distributor, we can help in setting up your online account and answer any of your Triops quality and product questions. Our sales department is available to help domestic and international retailers interested in selling Triops products. For press contacts or interviews. 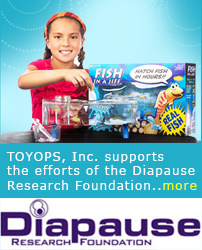 For information about the Diapause Research Foundation, please visit www.diapausefoundation.org or email questions@diapausefoundation.org.